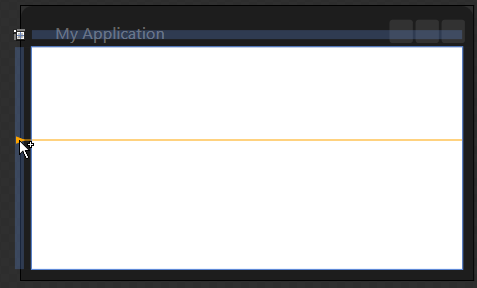 You can create a Grid element by editing XAML directly, in Visual Studio or Blend. You can also use the designer in Blend to add a Grid and set its properties. 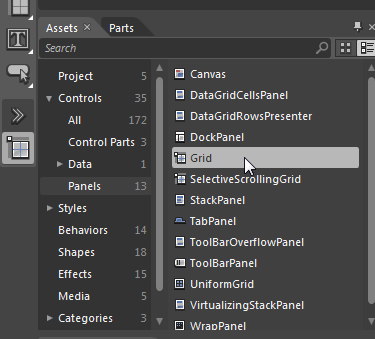 To add a Grid, find it in the Assets panel (under Controls | Panels). Double-click to add it to the current window. 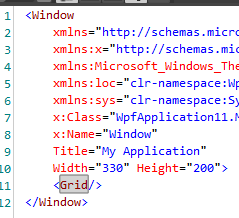 You’ll notice that a Grid element is added to the XAML (with no hard-coded dimensions). You can add rows/columns to the Grid by clicking in the blue bars at the left and top of the Grid in the designer. An orange triangle/line will appear, showing you the location of the new row or column. You can click on the icon next to each row (column) to cycle between Star sized, Pixel sized and Auto sized for the row height (column width). You can also set properties for the entire Grid from the Properties pane.